How can I integrate GetResponse with my PrestaShop ecommerce site? Use Web event tracking to see who visits your store, how often, and why. Send ecommerce data to GetResponse to keep you informed about their spending habits. Use this data to create marketing automation workflows that react to purchases, abandoned carts, or the amounts of money your customers spend. The list building tools in each of the plugins are available to all users as part of their pricing plan (Email, Max, Pro, and Enterprise). How do I download and install the GetResponse module using the PrestaShop admin panel? Go to https://github.com/GetResponse/PrestaShop/releases/tag/1.6.3.0 and download the most recent release of the zip file (don’t unpack it). Log into your PrestaShop administrative panel. Go to the Modules and Services section and click Add a new module. Click Browse to find the add-on archive you downloaded from the Marketplace. After the upload finishes, you’ll see that the module is ready for installation. You’re done. You can now connect your PrestaShop site with GetResponse. How do I install the GetResponse module manually on the server? Transfer the GetResponse module archive to the machine where your web server is running. Unpack the archive. When you unzip the module file, you get the getresponse folder. Note that when your server doesn’t have the tools to unpack the archive, you can extract the ZIP file elsewhere and transfer the entire folder to the server. Copy the getresponse directory to the modules directory within your PrestaShop installation. You’re done with server tasks. Go to the Modules and Services section. In the Modules list find the GetResponse module and click Install. How do I connect a GetResponse account with my PrestaShop site? Login to your GetResponse account. 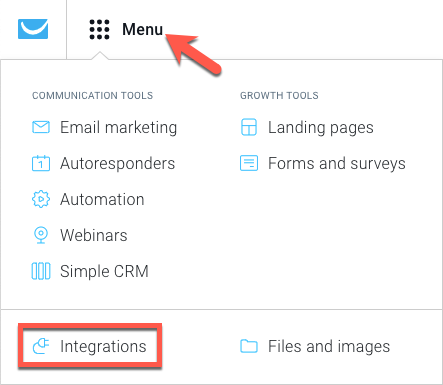 Click on Menu and select Integrations from the dropdown list. Generate your API key, give it a name and copy it. Log in to your PrestaShop administrative panel. In the side menu, click GetResponse and go to the GetResponse Account page. When you connect PrestaShop and GetResponse, you can access your lists, forms, and newsletters without leaving PrestaShop.